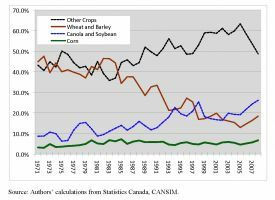 Agriculture in Canada was substantively transformed in the past century. In absolute terms, agricultural production increased considerably. For example, production of wheat, a major Canadian crop, based initially on the improved variety Marquis, trebled from 1908 to 2008. New crops, such as canola—improved varieties of rapeseed—on the Prairies and soybeans in Ontario, are now widely grown. Similarly, the numbers of livestock on farms have greatly increased since World War I, the number of cattle and calves nearly doubling, the number of pigs growing about four-fold, and the number of chickens trebling (Statistics Canada, 2009). In relative terms, however, primary agriculture’s share of the Canadian economy has shrunk to account for 1% to 2% of GDP and some 2% of national employment. Such structural change has been common in developed nations. Associated with economy-wide changes in the structure of agriculture, agricultural productivity has increased considerably over time, whether measured in terms of increases in crop yields, livestock gains, or growth in overall—total factor—productivity. Agriculture uses only 7% of Canada’s land mass and is concentrated in the southern portion of the country, chiefly in the Canadian prairies and the southerly reaches of Ontario and Quebec. The current Canadian farmland area of 67.8 million hectares (mha) has remained relatively constant since World War II, although the area in crops has crept upwards to some 36 mha (Statistics Canada, 2007). In western Canada, since the 1980s, while individual farms have become more specialized, aggregate agriculture has diversified away from cereal and coarse grains, mainly wheat and barley, to higher-valued crops such as oilseeds, chiefly canola, and pulses such as field peas and lentils. In terms of cropped area in Canada, despite having lost ground spring wheat still leads, followed by hay and other fodder crops, with canola now ahead of barley, in third place. The 2006 Census of Agriculture counted 229,000 farms in Canada reflecting a steady decline in farm numbers that began in 1941 (Statistics Canada, 2007; Mitura, 2007). Average farm size recorded in 2006 was 295 ha, ranging from more-intensive 100 ha farms in Ontario and Quebec to more-extensive farms in Saskatchewan, averaging nearly 600 ha. Farm size has also increased in terms of livestock numbers, most notably in hog farming where the number of pigs per farm rose by more than twentyfold from approximately 70 in 1971 to 1450 in 2008 (Statistics Canada, CANSIM 2009). Agricultural production is increasingly concentrated on specialized larger farms. In 2005, some 5,900 farms had gross receipts exceeding one million dollars. These “million dollar” farms represented only 2.6% of all farms in Canada but earned nearly 40% of total receipts. In contrast, farms with less than $100,000 (Canadian, currently $94,000 U.S.) in farm receipts comprised 65.6% of all farms and generated only 9.9% of all farm receipts (Mitura, 2007). Nearly 40% of Canadian farms are designated as crop farms, followed by beef farms at 26.6% of all farms. The mix of agricultural commodities varies among the provinces (AAFC, 2005). Production of red meats, along with dairy, is most important in Ontario and Quebec. Red meats, grains and oilseeds typically account for over 80% of market receipts in the prairie provinces of Alberta, Saskatchewan and Manitoba. In British Columbia, fruits and vegetables are important, while in Atlantic Canada, potatoes and dairy predominate. In 2006, nearly 7% of Canadian farms reported growing organic products for sale but only one-quarter of these were actually certified. Farm operators in Canada are getting older, now averaging 52 years of age (Statistics Canada, 2007). The economic well-being of farm households is increasingly linked to the nonfarm economy with nearly half of all farms reporting off-farm income. In 2006, 57% of Canadian farms were sole proprietorships, 27% were partnerships, and 16% were incorporated—a rising share but still largely family incorporations. Trade, particularly with the United States, is very important to Canadian agriculture. The red meat sectors, in particular, became increasingly integrated within the North American market in the past 15 years. Canada is ranked eighth in world cereal production and tenth in world meat production (Statistics Canada, 2009). From 1999 to 2008, an average of 48% of total farm cash receipts in Canada came from livestock receipts, 41.3% from crop receipts, and the remaining 10.7% from government program payments (Statistics Canada, CANSIM 2009). Livestock receipts generally exceeded crop receipts during this decade, although 2007 and 2008 were notable exceptions reflecting stronger grain prices and adverse red meat fortunes. Government payments increased, often on an ad hoc basis, in years of drought, animal disease, border problems, and financial stress. The pattern of crop receipts has changed considerably over time, as shown in Figure 1. The large share of the “other crops” category, which rose until 2004, reflects increasing diversification of Canadian crop production. Relative shares of wheat, excluding durum, and barley declined significantly whereas canola increased in importance. Corn and soybean shares both rose, but they still only contribute 6% and 5%, respectively, to Canadian crop receipts. Corn for bio-fuel production is not currently significant in Canada. Livestock receipts in Canada from 1971 to 2008 also portray shifting production patterns. In the last decade of this period cattle and calves contributed nearly 33% of total livestock receipts in Canada, with hogs providing 19%, dairy 26%, and chickens and hens 9%. The share of livestock receipts from cattle and calves dropped over time, while the hog share increased from the 1990s until 2004. Changes in crop yields are the most readily available measures of productivity gains in Canadian agriculture. Despite long-term declines in real crop prices, the output of the crops sector has increased through improvements in productivity evidenced in rising crop yields. Changes in technology have contributed to this productivity improvement. 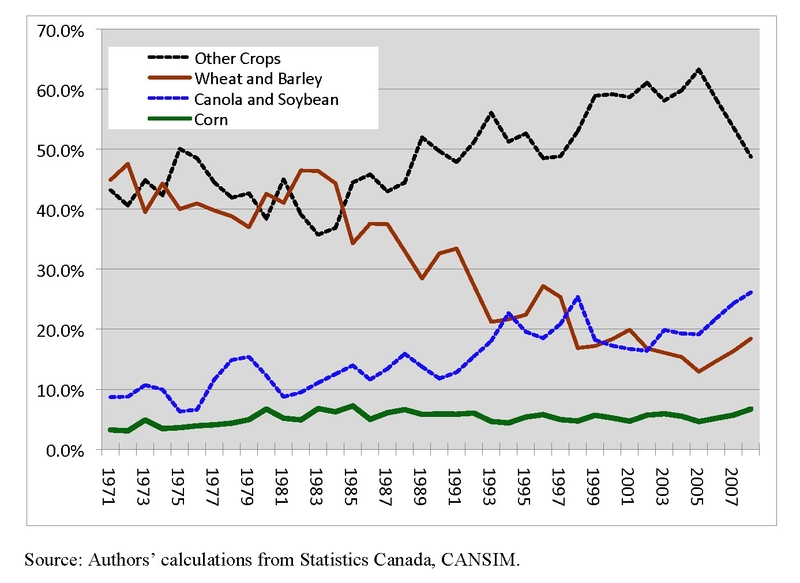 Yields of the major field crops grown in Canada—wheat, barley, canola, corn, soybeans, and peas—the most important of which are shown in Figure 2, all increased from the 1960s until the present. Several features are noteworthy, including the volatile nature of yields even at the national level, highlighting the important continuing role of weather in influencing annual yields. Further, indexed against a base of the 1960-64 average, yields of all these crops follow a similar trend, increasing by about 60% during the forty-seven year period to the point that statistical testing could not reject an identical linear trend coefficient for corn, wheat, canola, and peas. This is remarkable considering the varying locations, biological properties, farming systems, and research institutions associated with each crop. The linear trend suggests a constant absolute growth in yields, which implies a declining proportional growth rate, since the same absolute increase per year is a smaller percentage of the growing base—in fact, a 60% decline in the proportional rate of growth over the period. The yields shown in Figure 2, based on yield per seeded acre, do not reflect the changes in cropping intensity that have occurred in western Canada since the 1960s. As a result of the decline in summer fallow area, annual cropping intensity in western Canada has increased from 62% to 87% of cultivated area. If this increase in cropping intensity were to be reflected in yields, yield growth for wheat, barley, canola, and peas would be closer to 100%, rather than 60%, over the 47 year period. In contrast to trends in average actual farm crop yields, research trial yield indexes diverge markedly among Canadian crops. Both wheat and durum yields in experimental trials exhibited slow linear trends, increasing to 122% of the 1960-64 base yield over the period to 2006. However, canola yields in experimental trials grew unevenly, but quite rapidly, reaching 180% of base yields by 2006, while trial pea yields accelerated since 1994, achieving 148% of the base. Further analysis is needed to reconcile the differences between these growth patterns in experimental yield indexes and the patterns in Canadian average realized yields of the various crops. Many of the crops have also shown important changes in quality that increase value but are not captured in the yield figures. Spring wheat varieties were confined to hard red spring wheat in the 1960s. While hard red spring wheat still dominates plantings, new classes of wheat have been introduced with each wheat class made up of varieties that can be visually distinguished from other classes. Durum wheat now includes extra-high-gluten varieties. Canola was transformed from rapeseed in the early 1970s by a decade of public breeding that reduced the level of glucosinolates and erucic acid. In the mid 1990s herbicide tolerant and hybrid canola was introduced. Since 2000, new canola varieties high in oleic acid have been introduced. While feed is the primary use of barley, plantings continue to be dominated by two-row malting varieties, which replaced earlier six-row malting varieties. Discussion of productivity enhancement in cropping systems would be incomplete without noting the dramatic change in tillage systems. In the 1960s, fields were tilled extensively during the summer fallow period in much of western Canada, and tilled again prior to seeding. In the more-humid regions of central Canada, land was tilled with a moldboard plough to bury the stubble residue from the previous crop. Beginning in the 1970s, some farmers and industry groups began developing seeding systems and weed control systems that required less tillage. By the 1990s, very effective low-disturbance seeding systems had been developed and were rapidly adopted, especially in the prairie region. The new cropping systems reduce the demand for diesel, fuel, and labor, while increasing the demand for glyphosate herbicide and nitrogen fertilizer. They have reversed the long term decline in soil organic matter, increased carbon sequestration, made better use of available moisture, and significantly reduced both water and wind erosion. Livestock productivity gains have also been achieved from improved genetics, feed conversion, and management practices, as well as the exploitation of economies of scale in intensive production systems. Important livestock productivity gains include: an increase in cattle carcass weights of some 34% between 1980 and 2003; a 38% rise from 1990 to 2003 in production per sow due to larger litter sizes, more litters per year, and heavier carcass weights (AAFC, 2005); and a 43% increase in milk production per cow between 1991 and 2007. Finally, labor productivity in Canadian crop and animal production grew very rapidly from 1961 to 2005 at 4.7% per year, an estimate based on Statistics Canada data. Indeed, labor productivity growth in agriculture has been greater than in other sectors of the Canadian economy. 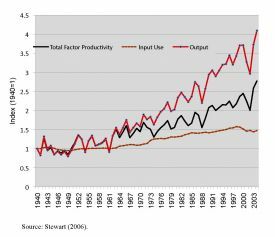 However, labor productivity growth considerably overstates the total productivity gains overall in agriculture, given the substantive increases in the use of material inputs and the historical capital-for-labor substitution in production. Partial productivity measures, such as yield per unit of land, can certainly be informative, as seen above. 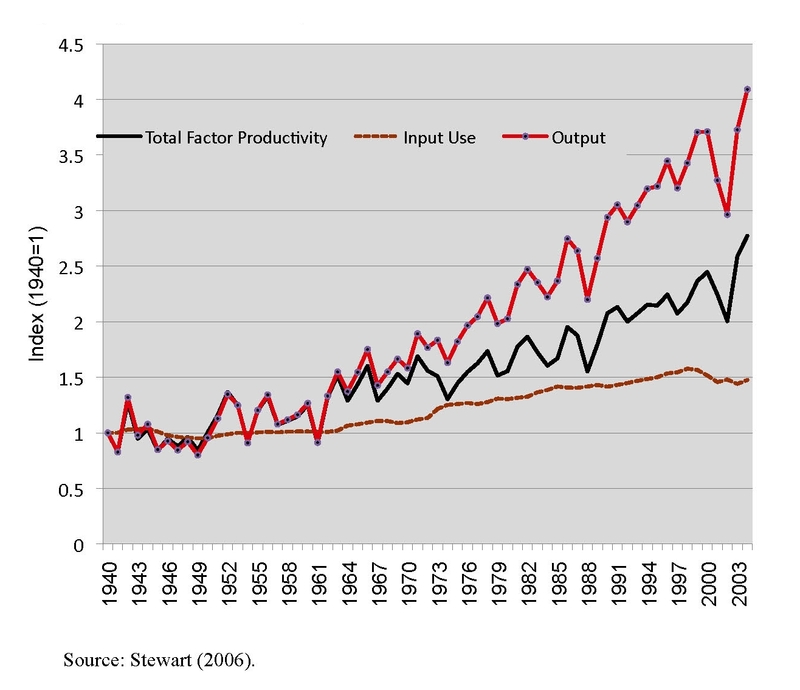 However, a much better indicator of productivity performance, if available, is total factor productivity (TFP). TFP or multi-factor productivity is the ratio of aggregate output to aggregate input, in which as many inputs in the production process as possible, rather than just a single input, are counted in evaluating productivity performance. There is modest historical literature on productivity growth in Canadian agriculture. However, the extensive body of agricultural-specific productivity analyses undertaken in the United States has not been replicated in Canada at the national level. Some empirical information on TFP in Canadian agriculture can be derived from recent data and work by Statistics Canada on productivity in the Canadian economy. 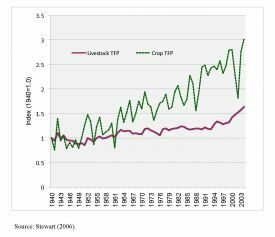 Over the period 1961 to 2005, TFP based on gross output for crop and animal production in Canada increased by 0.6% per year. In the same time period, TFP based on value added grew somewhat more rapidly at some 1.4% per year. Following Christensen (1975), we prefer TFP measures based on gross output rather than on value added. One possible reason why the TFP growth rate based on gross output is comparatively low is that the annual compound growth rate for all inputs combined in crop and livestock production is 2.4%, a rate considerably higher than in comparable American and Australian studies for aggregate input use in agriculture. The prairie provinces of western Canada are the “bread-basket” of Canadian agriculture, containing nearly half of Canada’s farms and much larger shares of its cropland and grassland bases. A lengthy time-series study of productivity growth in prairie agriculture, using total factor productivity measures based on Tornqvist-Theil indexing procedures, was recently completed (Stewart, 2006; Stewart, Veeman, and Unterschultz, 2009). Using this detailed case study, we now summarize estimates of output, input, and productivity growth for prairie agriculture from 1940 to 2004, including the disaggregation of this analysis to the crops and livestock sectors. 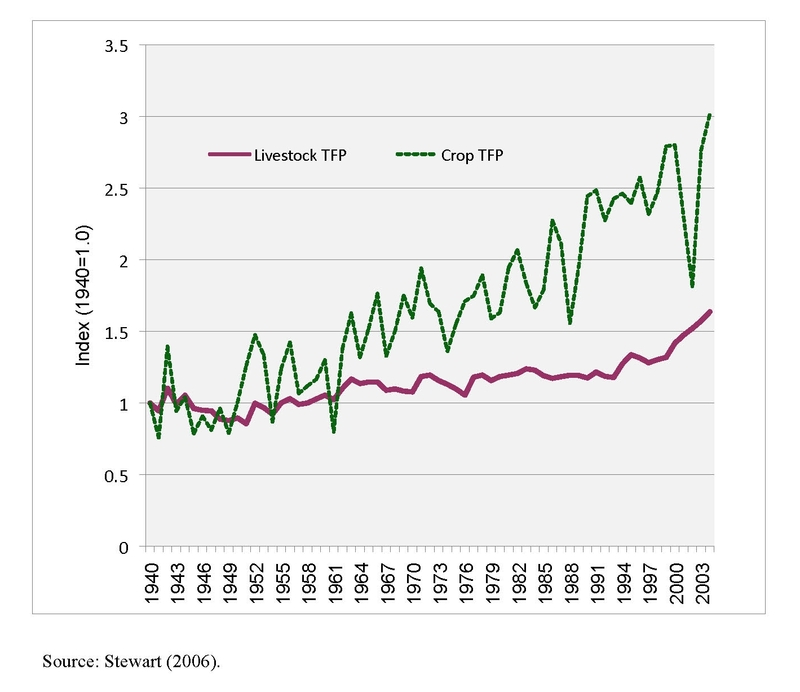 Prairie agriculture displayed relatively strong productivity performance over this historical period, with a compound annual TFP growth rate of 1.56% (see Figure 3). Aggregate output and aggregate input comprised of land, labor, capital, and materials grew, respectively, at 2.43% and 0.86% per year over the 1940 to 2004 period. Accordingly, productivity growth on a gross output basis accounts a 64% lion’s share of the considerable growth in prairie agricultural output over this 65 year period. Productivity growth estimates were also obtained for each prairie province, though not reported here, and for each of crops and livestock. As shown in Figure 4, productivity growth in the crops sector at 1.77% per year over the 65-year period is nearly three times higher than that in the livestock sector at 0.65% per year. This general result is also found in the United States (Huffman and Evenson, 1993). 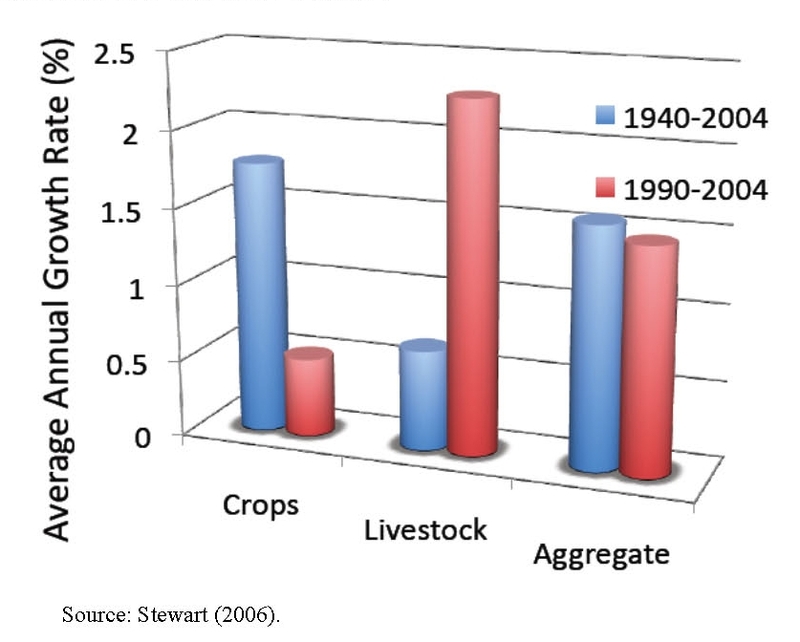 While prairie crop productivity growth declined during the final fifteen years of the study, notably in Alberta and Saskatchewan, livestock productivity growth accelerated considerably in Manitoba and Saskatchewan, largely off-setting the crop productivity decline (see Figure 5). Two contributors to the recent increase in livestock productivity growth, at least until 2005, were the major scale economies associated with the shift to intensive livestock operations and the increased attractiveness of livestock feeding in the Prairie region due to the removal in 1995 of the Crow Rate rail shipping subsidy on grain moving to export position. The stronger productivity performance in the prairie crops sector from 1940 to 2004 does not mean, however, that the “profitability” of the crops sector has been better than that in the prairie livestock sector. In fact, the terms of trade—output prices relative to input prices—facing the crops sector has deteriorated more rapidly over time, at -2.57% per annum versus only –0.29% for the livestock sector. The terms of trade for prairie farmers is heavily influenced by productivity growth outside Canada, which drives global relative prices, rather than by the much smaller influence of productivity growth inside Canada. Productivity advance has slightly outpaced cost-price squeeze pressures in the livestock sector over time, but not in the crops sector on the Canadian prairies. By decomposing estimated productivity growth into its constituent parts, technical change was concluded to be critical in the crops sector, whereas the roles of technical change and scale impacts have been roughly equal in the livestock sector (Stewart, Veeman, and Unterschultz, 2009). Over time, with increasing consolidation and specialization, Canadian primary agriculture has evolved to a sector characterized by fewer farms in number but much larger in size. As in many developed nations, large farms in Canada account for most of the agricultural production. In terms of farm receipts, red meats, grains and oilseeds led by wheat and canola, respectively, and dairy are Canada’s most important agricultural commodities. However, Canadian farmers have been diversifying their production mix to reach niche markets, increase value added, and spread risk. Since the early 1960s, the yields of several major crops have increased by approximately 60 %. Yield trends for corn, wheat, canola, and peas are remarkably similar, exhibiting consistent absolute growth in yields, but declining proportional rates of growth over the period. Labor productivity in crop and animal production in Canada grew rapidly at 4.7% per year from 1961 to 2005. Total factor productivity (TFP) growth for crops and livestock was considerably slower, ranging from 0.6% per year based on gross output to 1.4% per year based on value added. More research on productivity estimation and analysis that is directed explicitly to the Canadian agricultural sector could clarify these differences and strengthen understanding of agricultural productivity at the national level. In western Canada’s prairie region, productivity growth estimated at nearly 1.6% per year since 1940, has been very important to the growth of prairie agriculture. 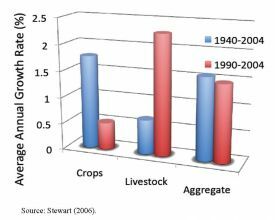 Crop productivity growth outpaced that of livestock historically, but not from 1990 to 2004. Our research indicates that a slowdown in spending on agricultural R & D (Gray 2008) in the past two decades is one contributing factor to slower productivity growth, especially in the crops sector. Stewart (2006), in assessing possible causal factors underpinning productivity growth in prairie agriculture, points to the effects of a stagnant knowledge stock variable, derived from past R&D expenditures, since 1990. Further, in Canada, as in the United States, agricultural R&D has shifted away from direct improvement in crops and livestock to other societal priorities such as food safety and the environment. In summary, both the study of Canadian crop yields and the analysis of total factor productivity growth in the crops sector in the prairie region of western Canada indicate a slow-down of productivity growth in crop production since 1990. Increased funding for agricultural research would help to counter the productivity slowdown in crops and to ensure that future livestock sector productivity growth could be based relatively more on technical change and less on scale economies associated with output expansion. Improved productivity performance, led by increased funding for R & D, is critical to the future competitiveness and economic sustainability of Canada’s primary agriculture. AAFC (Agriculture and Agri-Food Canada). (2005). An overview of the Canadian agriculture and agri-food system. Ottawa, ON. Christensen, L.R. (1975). Concepts and measurement of agricultural productivity. American Journal of Agricultural Economics. 57(5), 910-915. Gray, R. (2008). Agricultural Research at a Crossroads. Canadian Journal of Agricultural Economics. 56(1),1-11. Huffman, W.E., and Evenson, R.E. (1993). Science for agriculture. Ames: Iowa State University Press. Mitura, V. (2007). The changing structure of Canadian agriculture. Presented at the Canadian Agricultural Economics Society annual meeting, Portland, OR, July 31. Statistics Canada. CANSIM database (accessed June, 2009). Statistics Canada. (2007). Snapshot of Canadian agriculture. Ottawa, ON. Statistics Canada. (2009). Human activity and the environment: Annual Statistics (Special feature on “Food in Canada”). Catalogue no. 16-201-X. Ottawa, ON. Stewart, B. (2006). Measures and causes of productivity growth in Prairie agriculture: 1940-2004. MS thesis, University of Alberta. Stewart, B., Veeman, T.S., and Unterschultz, J. (2009). “Crops and livestock productivity growth in the Prairies: The impacts of technical change and scale.” Canadian Journal of Agricultural Economics, 57(3), 379-394. 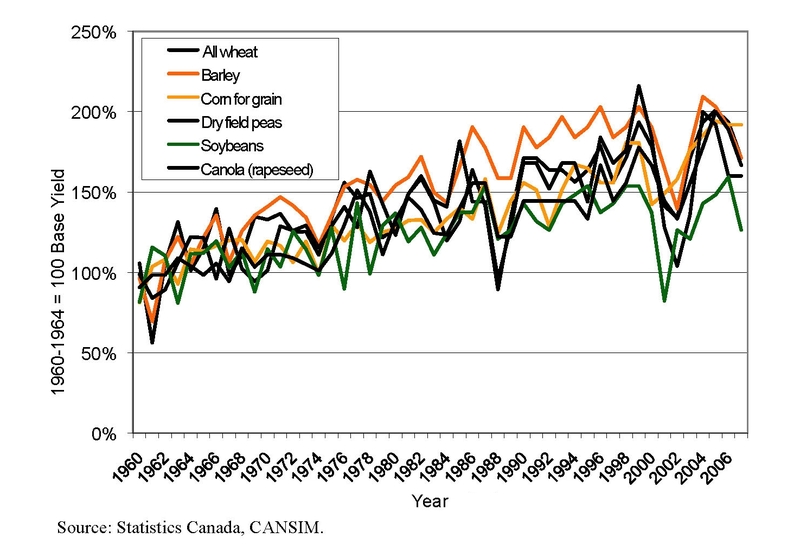 Canadian Crop Yield Indexes, 1960 to 2007 (Base 1960: 1964 = 100). 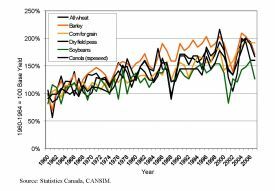 T�rnqvist-Theil Indexes of Crops and Livestock Total Factor Productivity (TFP) for the Canadian Prairies: 1940-2004. Terrence S. Veeman (terry.veeman@ualberta.ca) is Professor Emeritus, Departments of Economics and Rural Economy, University of Alberta, Edmonton, Alberta, Canada. Richard Gray (richard.gray@usask.ca) is Professor, Department of Bioresource Policy, Business and Economics, University of Saskatchewan, Saskatoon, Saskatchewan, Canada. We gratefully acknowledge the assistance of: Bryce Stewart, formerly at the University of Alberta; Cecil Nagy, Jill McDonald, and Simon Weseen at the University of Saskatchewan; and Verna Mitura of Statistics Canada.